We’d love your help. 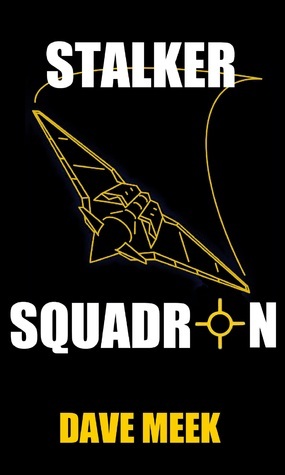 Let us know what’s wrong with this preview of Stalker Squadron by Dave Meek. U.S. Air Force Major Kate Walker, mother of three, is a top-notch fighter pilot who trained a squadron of super-stealthy drone warplanes called Stalkers how to fight. Dr. Truxel R. Thorn is a renegade computer genius whose synthetic neuron is the "brains" behind the Stalkers' amazing abilities. Now Thorn has embarked on a personal vendetta against the President of the Unite U.S. Air Force Major Kate Walker, mother of three, is a top-notch fighter pilot who trained a squadron of super-stealthy drone warplanes called Stalkers how to fight. Dr. Truxel R. Thorn is a renegade computer genius whose synthetic neuron is the "brains" behind the Stalkers' amazing abilities. Now Thorn has embarked on a personal vendetta against the President of the United States. He leads a coup that sets the Stalkers on a path to ignite a nuclear war between China and the U.S. Kate must fight her way past a group of Thorn's mercenaries who have captured her, and past the fears she has for her injured daughter, to stop the Stalkers that she made invincible. To ask other readers questions about Stalker Squadron, please sign up. Stalker Squadron reads like a very good season of ’24′. It’s a techno-thriller with strong roots: characters which fit with the established expectations (an FBI agent, a mad scientist, a hacker, an ace pilot…? wait…) but who have genuine heart and make you want to read more about them. Agent Slade is no Jack Bauer, but that’s a good thing — though the character archetypes fit the standard mold, they stand apart with unique personalities and feel like action-movie versions of real people. I’ve re Stalker Squadron reads like a very good season of ’24′. It’s a techno-thriller with strong roots: characters which fit with the established expectations (an FBI agent, a mad scientist, a hacker, an ace pilot…? wait…) but who have genuine heart and make you want to read more about them. Agent Slade is no Jack Bauer, but that’s a good thing — though the character archetypes fit the standard mold, they stand apart with unique personalities and feel like action-movie versions of real people. I’ve read well-regarded trade published works featuring characters with less heart. The technology is given in doses that feel both creative and believable. The political conflict is intriguing and also seems to spring straight out of real life — making me think that Mr. Meek clearly has a good handle on world politics and history. Interpreting the reactions of large nations is not always an easy thing to do, and projecting them into hypothetical circumstances is even harder, but Mr. Meek handles it with ease. I believe I noticed a single typo in the book – an instance of ‘breath’ when it should have been ‘breathe’ (somewhere near the middle-end). I am impressed by the obvious care and craftsmanship that went into this book in both writing and editing.